For 20 minutes Andrea McColl, a research assistant at the University of Southern California, has been repeating the same string of nonsense syllables, changing her intonation on cue. When a smiling cartoon face pops up on the screen in front of her, she tries to sound happy. When a frowning face pops up, she sounds sad. And then, again on cue, she falls silent, listening via a headphone as an actress runs through a similar da-da-da-da-da routine. It's an exercise that would seem trivial, even silly, were McColl not lying on her back inside a brain-scanning machine. She's one of the first participants in a research project designed by Lisa Aziz-Zadeh, a neuroscientist at U.S.C. 's Brain and Creativity Institute, to test an intriguing question at the heart of a new field of brain research: Do areas of gray matter respond to the emotional contours of speech produced by others in the same way they do when we ourselves are speaking? The question is one few researchers would have thought of asking a decade ago. But that was before University of Parma neuroscientist Giacomo Rizzolatti and his colleagues began publishing the eyebrow-raising results of experiments they had been conducting with macaques. The Italian scientists were monitoring the monkeys' brain activity--observing how neurons in the premotor cortex buzzed with activity as the animals grasped a piece of food--when something strange kept happening. The monkeys would be sitting still, doing nothing in particular, and one of the researchers would pick up some raisins or sunflower seeds in order to place them on a tray. At that point, the same neurons started buzzing again, in just the same pattern. The scientists couldn't explain it; they thought that perhaps the monkeys were subtly moving in anticipation of being fed. 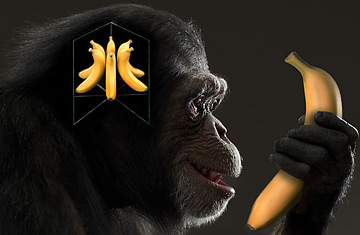 Through a series of experiments, however, they finally established that the neurons started firing whenever the monkeys saw a person grasp an object. It was as if the monkeys were mentally mirroring the action they observed. Brain scans have now indirectly established the presence of similar monkey-see-monkey-do neurological activity in human subjects, and mirror neurons, to use the term the University of Parma team coined, have emerged as a compelling biological explanation for a broad range of brain activity, from a newborn's instant response to a mother's smile to a movie audience's gasps during a particularly effective chase scene. Indeed, there are multiple if still tenuous lines of evidence to suggest that neural networks with mirror properties may be responsible for the empathetic response that forms the root of social behavior. They may also help explain how human language emerged from the more primitive communication systems of monkeys and apes. Almost seven years ago, Vilayanur Ramachandran, head of the Center for Brain and Cognition at the University of California at San Diego, went so far as to declare that "mirror neurons will do for psychology what DNA did for biology: they will provide a unifying framework and help explain a host of mental abilities."